Over the past decade, agricultural investment has been presented as a catchall solution to a converging set of global crises, often with poor rural communities as the proclaimed beneficiaries. Yet the promises of such investment, such as poverty alleviation and improved food access, are routinely at odds with realities on the ground. This article offers frameworks for analysis of agricultural investment that are grounded in the realities of small-scale food providers, drawing from two studies. The first study employs a right to food framework to identify the main channels through which food for consumption is procured by small-scale food providers and the factors impacting these channels. It draws on empirical data from within the Southern Agricultural Growth Corridor of Tanzania (SAGCOT), an investment model promised to lift rural communities out of poverty, which reflects a regional trend. 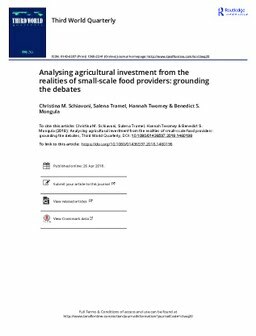 Based on the shortcomings of the large-scale investments examined, the second study employs a food sovereignty framework to explore alternative forms of investment envisioned and/or already being put into practice by small-scale food providers in the SAGCOT area and elsewhere in Tanzania. While two different frameworks formed the basis of two different studies, both the studies and their frameworks are interrelated. The final section of this article makes the case for why both the right to food and food sovereignty are essential lenses for understanding agricultural investment vis-à-vis small-scale food providers and the ways in which they can serve as complementary tools for effective analysis.